I have a mixed relationship with this book. I’m not usually into high fantasy, but this was described to me as the next Harry Potter, so I couldn’t turn it down. I had to force myself to read the first three quarters of the book, but once I hit the final hundred pages I couldn’t put it down. You can’t really talk about The Bone Season without talking about Paige. She is a perfect protagonist for this book and a worthy addition to the strong female protagonist troupe. The Daily Telegraph is right ( quoted on the back of my book), Paige is ‘reminiscent of Katniss Everdeen from the Hunger Games’. In fact, maybe super reminiscent of Katniss, but I love Katniss so I’ve no problem with that. Paige is strong, brave and selfless, and the narrative wouldn’t make sense with any other character. Paige is from the Emerald Isle, and as someone from the Isle itself I found the portrayal of Ireland in this book quite interesting and very amusing. Paige is from Clonmel in Tipperary, the dairy farming, cattle-rearing land, nestled in the golden and green vales of the south of Ireland. Everything about the Ireland in this book is vaguely magical, free and untamable place, which I always find kind of hilarious. The riots that take place in Dublin as Scion tries to take over are called ‘The Molly Riots’, probably because the rebels stand their ground beside the Molly Malone statue. Which is a terrible location, strategically speaking. While it was really nice and entertaining to have a shout out to the motherland in such a popular novel, I’m still waiting for the day that Ireland is portrayed as more than a hoshposh of magic, wistful red haired maidens and badly organised and under equipped rebels( to be fair we do have a reputation for being fairly shite at rebellions, so I might give her that one). 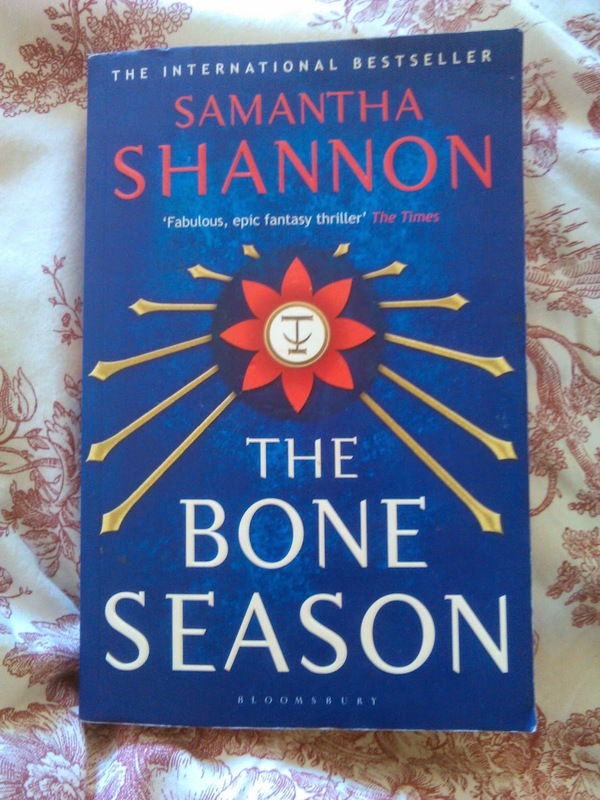 The Bone Season is definitely high fantasy, so I was pretty overwhelmed by the sheer volume of information thrown at me in the first few chapters. Shannon dives straight into her world building, and doesn’t leave much time for newbies like me to catch up. If you’re well seasoned in high fantasy you’ll probably be fine, but if you’re unfamiliar with the genre I’m not sure I would recommend this as the best place to start. I spent the whole book misunderstanding the whole clairvoyance thing, and I had absolutely no clue what the Emim and the Rephaim were supposed to be. My copy had a handy glossary of new terms which I referenced far more than is respectable, but had to in order to survive .I'm not even going to bother trying to explain it’s so complicated. I would also recommend reading it in one go. It’s fairly plot intensive, and when I came back to it after putting it down for a few weeks I hadn't a clue what was going on and had to retrace my steps. Of course their is an inappropriate romantic relationship.Of course their is an inappropriately timed make-out session. But personally, I’d be pissed off if their wasn't, so I'm not complaining. Anyway It’s such a tiny part of the book, if it’s not your cup of tea you can just pretend it never happened. It took me a while to get through but it was so worth it in the end. I’m definitely looking forward to starting The Mime Order sometime soon. When it comes out in paperback, because I’m poor….